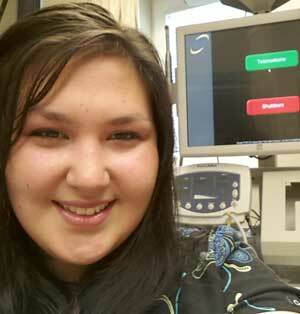 Danielle Reynolds, a community health aide, uses telehealth equipment to provide screenings for patients in a remote area of Alaska. As a community health aide (CHA) at Savoonga Clinic in Savoonga, Alaska, 21-year-old Danielle Reynolds sees patients of all ages who come seeking help for medical, dental and hearing issues. Savoonga Clinic serves about 1,000 Alaskan tribal members living on Saint Lawrence Island in the Bering Sea, closer to Russia than the Alaska mainland. The clinic has no physician or midlevel provider on staff, the nearest hospital is in Nome, on the mainland, and the only way off the island is by air. Telehealth technology is the lifeline that connects clinic staff to medical specialists when they encounter problems beyond their expertise. Savoonga is among 15 tribal villages equipped with telehealth carts that allow images, video clips, scanned documents and specific test results to be stored and forwarded to appropriate medical resources. The carts include automated forms and equipment for primary care assessments, EKGs, ear, dental and skin problems. On this particular day, Reynolds sees a child with ear pain, drainage and a history of ear infections. CHAs and CHPs (community health practitioners) in Alaska have standing orders to provide routine ear care. But in a case like this, consultation with a specialist is recommended. Using tools on the cart like the video otoscope and tympanometer to take detailed pictures and measurements of the inner ear, Reynolds completes an automated form and transmits the form and images to Norton Sound Health Corporation (NSHC) in Nome, a tribally owned healthcare organization serving approximately 10,000 Inuplaq and Yupik people living in the 15 isolated villages that span 44,000 square miles along the Bering Sea. The NSHC audiologist will review Reynold’s case and respond. Audiologists typically diagnose and rehabilitate patients with ear, hearing and vestibular disorders. If the case warrants an ENT (ear, nose and throat) consultation or patient referral, the audiologist telemedically forwards the information to ENTs located at the tribally owned hospital in Anchorage, 500 miles from Nome. When Dr. Phil Hofstetter, NSHC Vice President of Hospital Services, first moved to Alaska to work as an audiologist, 47 percent of patient referrals waited five months or longer for an ENT appointment. According to Hofstetter’s research done on the audiology telehealth program’s first six years, wait times dropped by 50 percent. Previously, audiologists and ENTs periodically flew to villages to hold clinics and see patients. Hofstetter said the transition from audiologists being a patient’s first point of contact to training the community health aides to do audiology assessments further improved patient wait times and audiologists’ productivity. With telehealth, patients triage through the medical process under the care of a CHA/CHP, dramatically decreasing their need to travel to the mainland for appointments or having to wait until the next on-island clinic is held. 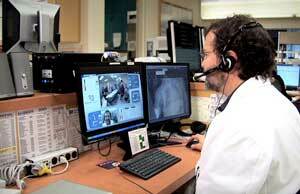 In addition to improving patient access, Hofstetter said, telehealth enhances safety. Small aircraft travel is hazardous given the terrain and weather conditions. Travel savings alone is projected at $10 million this year. But implementing telehealth—and all that goes with that process—is no easy task. Thirteen years ago, when the Alaska Native Tribal Health Consortium (ANTHC) received federal funding for telehealth development, live video conferencing was the primary means being developed in other areas of the country. Live video conferencing systems have also been added as connectivity improved throughout the state with ongoing cable installation. This year, Roleff said, more than 60,000 patient cases benefited from telehealth; there have been nearly 200,000 cases to date. Policy issues, such as physician credentialing and licensure, and reimbursement for services have also provided some of the biggest barriers to the deployment and growth of telehealth. Many states still require physicians to be licensed and credentialed in the place where the patient is located, a conundrum for providing telehealth services where a clinic or hospital and its patients may be in one location and a consulting physician specialist can be half a continent away. According to a National Telehealth Policy Resource Center (NTPRC) report released in March, every state is unique in its telehealth policies. Some states have incorporated policies into law and others have addressed issues with changes in Medicaid program guidelines. Some states have inconsistencies even within their own policies. Reimbursement systems are equally complicated and also vary from state to state. Telehealth reimbursement in many states ranges from no coverage at all to limited or specific types of coverage. Medicaid, for instance, reimburses for telehealth in some states but not in others. As of this writing, according to the National Conference of State Legislatures, 42 states provide some form of Medicaid reimbursement for telehealth services, and only 15 states require private insurance plans to cover telehealth services. A physician with the Telehealth Alliance of Oregon confers with a remote patient. Oregon has successfully addressed and resolved some of these challenges through state legislation. In the late 1990s, the Legislature approved formation of the Oregon Telecommunications Coordinating Council with the Telehealth Alliance of Oregon (TAO) formed as a council committee. In 2005, TAO organized as a nonprofit corporation. TAO’s first task was to help secure grant funding for broadband development in rural areas, a process that required 124 amendments to the proposed legislation and nearly a year of work, said TAO board member Catherine Britain. Reducing reimbursement and credentialing barriers have been among TAO’s more recent challenges. 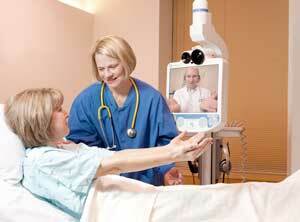 Britain praised Oregon’s State Legislature for its proactive support of telehealth. Reimbursement systems historically have paid providers for physical patient visits in specific healthcare settings. Oregon’s 2009 Senate Bill 24 requires all payers to reimburse for services delivered telemedically. This last session, Oregon’s legislature approved SB 569 to create a plan for a ubiquitous credentialing system throughout the state. A patient meets her physician via computer screen in a partner hospital of the Telehealth Alliance of Oregon. Britain said telehealth is a crucial component in Oregon’s new Coordinated Care Organizations (CCOs) for Medicaid patients, a value-based model being implemented with a $45 million Centers for Medicare and Medicaid State Innovation Model grant. CCOs are similar to Accountable Care Organizations (ACOs), which are mandated by the ACA. As rural providers continue to work through the challenges associated with implementation and growth, they do so knowing that telehealth’s cost savings and proven efficiencies in rural areas make it highly likely that telehealth is here to stay. This entry was posted in Features and tagged Alaska, Community health workers, Health aides and assistants, Healthcare business and finance, Healthcare workforce, Licensure and certification of health professionals, Oregon, Reimbursement and payment models, Service delivery models, Telehealth on August 13, 2013 by Rural Health Information Hub.